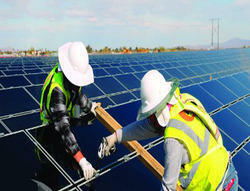 We are leading servicve provider of Solar Power Plant Maintenance Service. With the aid of years of experience of this domain, we render the premium quality of Solar Power Plant Maintenance Service. Known for systematic execution and cost effectiveness, the solar plant maintenance services are rendered by us in user-defined specifications. Timely maintenance services of solar plant are assured by appointment of qualified technical support staff.